I sometimes wonder if there is a target on the back of my car. In the almost six years I have owned my car, it has been rear ended a total of three times. At this rate, the insurance company might start thinking I am trying to scam them or something. The most recent accident happened while shuffling home during rush hour traffic on the southbound 405 freeway. Unfortunately, the damage was pretty bad, which meant that my car would be sitting in a body shop for a few days while I would be driving around in some sort of rental car. And so, after leaving my S2000 at the insurance approved body shop, I was shuttled off to the local Enterprise branch to find out what my $35 per day rental coverage would get me. Initially, I thought I would end up in at least a Chrysler 200, which I think is a fairly decent looking vehicle. Unfortunately for me, the local Enterprise essentially had nothing left when I arrived...except for a new 2016 Corvette convertible and a 2016 Dodge Challenger SXT. Naturally, I wanted the Corvette, but unless there are some pigs with wings floating around in the sky I do not know about, I am certain my insurance would definitely not cover the entire cost of renting that. Frankly, my insurance was not going to cover the entire cost of renting the Challenger either, which was an extra $20 per day. So I was told to take the Challenger and come back the following morning to see if they had any returns. I returned the following morning, only to be told that all of their returns had already been spoken for, so rather than just send me off on my way again, Enterprise offered to lower the rate of the Challenger to the $35 per day my insurance was going to pay out. And that is how I ended up driving a 2016 Dodge Challenger SXT for four days. So what is the first thing you will notice when looking at the Challenger? It is huge. Really huge. The darn thing is longer than both our Acura RLX and Acura MDX. It also has a very intimidating front fascia. With its size and intimidating looks, I found an interesting advantage that this particular vehicles has over pretty much any other vehicle I have ever driven (more on that later). But as big and intimidating the car looks, the one place Dodge fell short is with its wheel and tire choice for the SXT trim. The standard 18 inch wheels look incredibly out of place on a car so huge, and I simply cannot believe that Dodge thought it was cool to wrap terrible 235 width all-season tires on a car that makes 305 horsepower. The only good thing to come of the skinny, crap tires? Awesome burnouts! The interior of the car is...a step up from rental car standard. 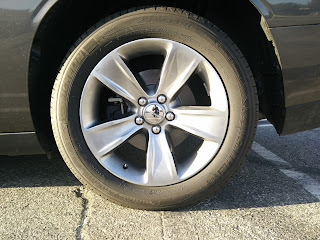 Kudos to Dodge for using better materials in their current vehicles. Yes, there was still some cheap feeling plastic (which was most of the black colored plastic) around the vehicle, but unless you actually spend the time touching every surface, like I did, you probably would not notice. My favorite interior accent was the brushed metallic looking trim that surrounds the gear shift and HVAC controls. Yes, it is also plastic, but it seems to work well with the rest of the car. 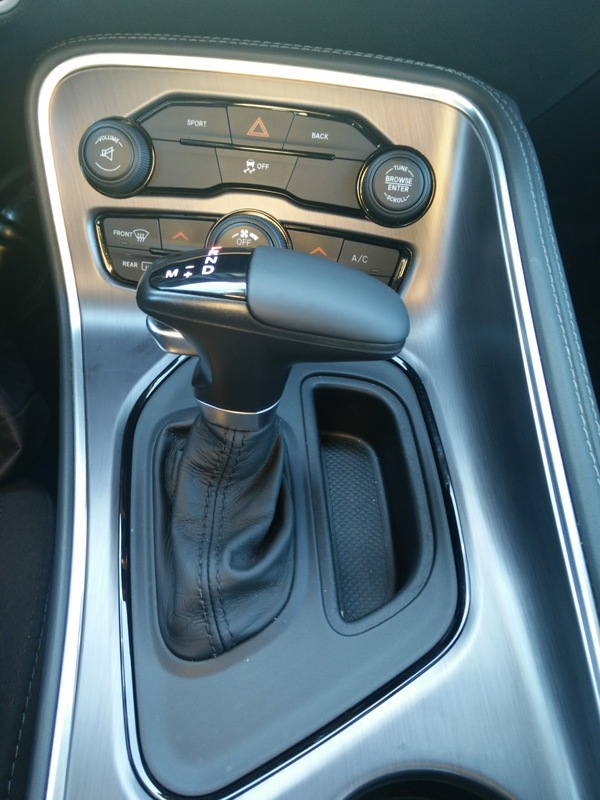 Speaking of the gear shift, it looks like Dodge tried to do a modern take on the ratchet style automatic shifter. I am not entirely convinced the car needs it, but it does give my hand a nice place to rest while cruising. As for the rest of the interior, it is really not bad at all. The cloth does not have that terrible, cheap, econobox feel, the infotainment display is brightly lit, and I actually had quite a bit of fun with the multi-information display. It has a "performance" meter that times your zero to 60 acceleration, and calculates your 60 to zero stopping distance. Biggest complaint? How can you have a car that has seats with power controls that only control the seat bottom, but a manual lever for the back? Just use one or the other please! Admittedly, I was fairly skeptical of the Challenger's performance. It is a big, heavy beast, and on paper, it seems like the 3.6 liter Pentastar V6 probably would not be up to the task of lugging the behemoth around. 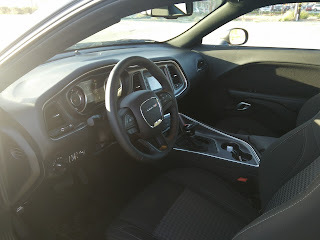 But then, I thought back to my experience with the V6 Camaro Convertible, which was not exactly a tiny car either, and figured it probably could not be too bad. Thankfully, it was rather pleasant. 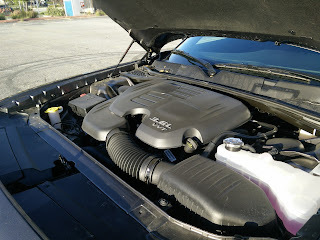 In fact, I was actually quite surprised with the Pentastar's performance. While obviously not 5.7 liter HEMI fast, it was still pretty quick for what it was. Put the car into sport mode, turn off the traction control, stand on the brake with your left foot, bury the throttle with your right, let off the brake, and be prepared for some surprisingly smokey burnouts. Of course, said smokey burnouts probably have a lot more to do with the skinny all-season tires at the rear than the power from the engine. Hooning around aside, the V6 equipped Challenger does accelerate quite well, even providing a very throaty exhaust note when pushed hard. At cruising speeds, the engine does not sound quite as good, but definitely feels most comfortable at cruising speed. If anything, the V6 Challenger feels more like a cruiser than a bruiser like its HEMI equipped brethren. Even more surprising was the Challenger's ZF eight-speed automatic. 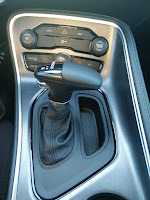 I have always been relatively skeptical of automatic transmission with more than six speeds, but as the ZF eight-speed has been around for a while, most of the kinks have been worked out. In the Challenger, it works pretty well while just cruising along the road, staying in gear only until you prod at the throttle. In sport mode, things are a tad bit more dicey as the transmission does have a tendency to hunt around for gears a little more frequently to try and keep the car accelerating. But aside from the occasional gear hunting in sport mode, the transmission actually does shift quite smoothly left to its own devices, and quite quickly in manual mode. Handling, unfortunately, is not this car's strong suit. 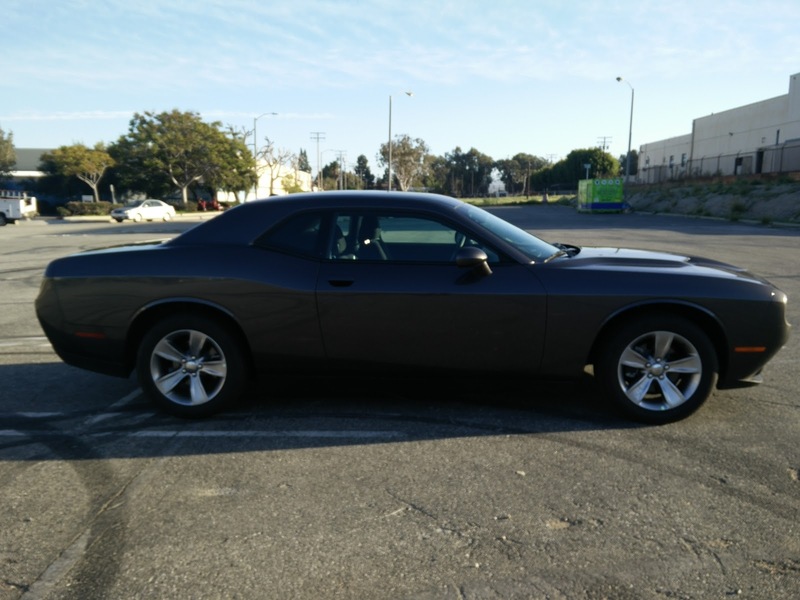 Again, the SXT trim definitely makes the Challenger feel more like a cruiser than a sports car, and the suspension, braking, and steering setup certainly reinforces those feelings. While not luxury barge soft, the suspension does have quite a bit of give, which is great for driving over poorly paved roads, but terrible when cornering. The softer suspension setup, along with the car's heft, makes this car roll quite a bit during cornering, and is quite scary. Coupled with the horrid all-season tires, I dared not take a corner too quickly for risk of flipping the darn thing over. Making things worse was the steering. While not completely devoid of feedback like some econoboxes, it may as well have been. Well weighted, yes, but the only feeling you get is just vibration from the road. Turn the steering wheel and...wait...did the front wheels actually turn? The one bright spot had to be the brakes, but that might also have to do with the fact that my own car's brake pads, at the time I had the Challenger, were almost non-existent. Pretty much anything that had working brake pads was probably going to be better than what I had in my own car. By the time you read this though, I will have already replaced the pads in my S2000, and yes, they kick the crap out of the brakes in the Challenger. 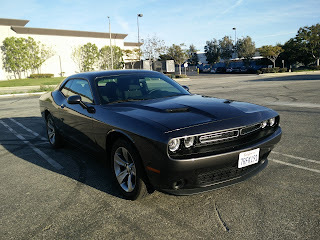 So what did I take away from my four days with the 2016 Dodge Challenger SXT? As a cruiser, it is nice. Do anything beyond cruising and accelerating in a straight line? Get something else. What I did discover about this car though is that people seem to be afraid of it. I am assuming due to its size and intimidating looks, it was incredibly easy to change lanes and no one dared to try and cut me off. I bet that if I had an SRT version, or (in my dreams at least) a Hellcat, people would really be getting out of the way. 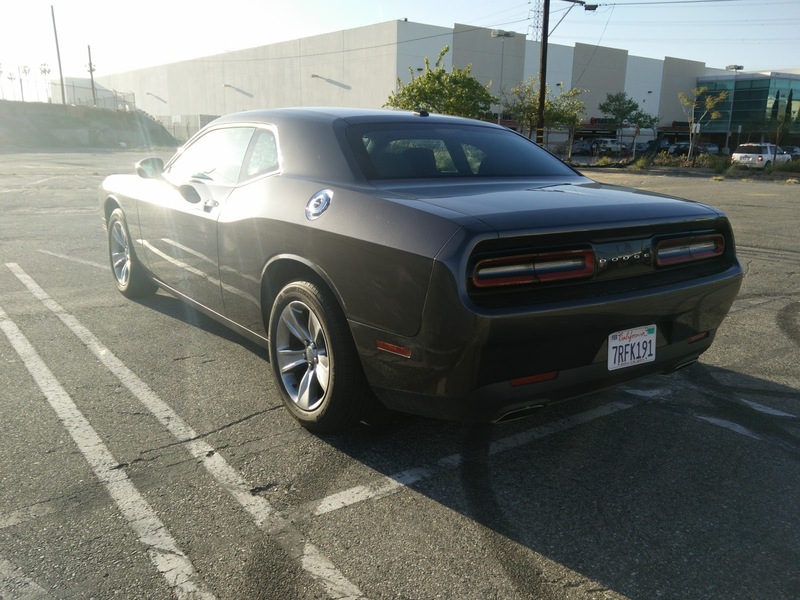 For me though, I have zero interest in a cruiser and would never consider a Challenger in SXT trim. 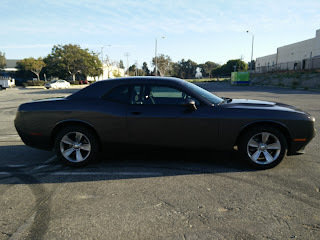 Frankly, I would never consider a Challenger period since it is so unbelievably huge, with the exception of the Hellcat. You always make an exception for the Hellcat.